Saturday was another great day here in Tokyo. Today was the first organized sightseeing tour and it was very interesting. We started off at Asakusa Kannon, Tokyo’s most famous temple. The legend has that two fisherman caught a golden statue of Kannon, a Buddhist goddess, from the river. A shrine was built in her honor and later a temple in AD 645. The architecture of the shrine was of more traditional Japanese style, as compared to the tall, modern skyscrapers that are prevalent in Tokyo. Thousands of Japanese aligned the streets and steps of the temple, gathering to pray. It was a funny sight to see a group of tall and strong MLB players towering over the friendly Japanese people. We got a lot of funny looks and giggles to say the least. From there we took a short boat trip down the Sumida River where we disembarked at Hamano-rikyu, known as Samurai Gardens. After a short stroll through the gardens we were treated to a traditional Japanese lunch consisting of different types of sushi. 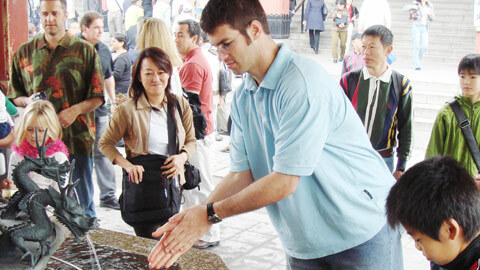 Joe Mauer cleaning his hands in accordance with Japanese customs at the Sensoju Temple. After cleaning your hands, you are suppose to drink the water, which Joe decided not to do! Standing in the Kannon temple gave me great appreciation for the history of Japan, which dates back much much longer than the United States. America seems like such a new country relative to the ancient history of other places like Japan. It was a wonderful experience to see a traditional, ancient part of Japanese religion and to understand how it impacts Japanese culture today. As for baseball, we came away with another solid, but close win. The star of the day was Ryan Howard, who hit two of the most impressive home runs I have seen. The first was an opposite field line drive and the second was a moon shot to dead center field. The home runs came in his first two at bats of the game. When the Japanese pitcher walked him on four straight pitches in his third at bat the fans became very upset, voicing their displeasure at the pitcher. It was pretty cool to see the Japanese fans excitement over the home runs and how they wanted, and perhaps expected, a home run each of his following trips to the plate. Another bright moment occurred when Tadihito Iguchi smoked a double down the left field line to score two runs. I’m sure it was a great feeling for him to have success in front of his native fans. Lyle Overbay provided the finishing touches with a homerun in the top of the 9th to extend our lead and Brian Fuentes closed out the game to earn the save. The two games against NPB have both been extremely competitive and exciting, exactly what was expected of the series. Fortunately we have come out on the winning end both times. Congratulation on another win! It sounds like it was another great game! I am happy to hear that you are having a great time in Japan. Can’t wait to hear more about your experience in Japan. I’m so happy that you guys got another win! Japan sounds really interesting, hopefully one day I can go see it for myself. I’m glad that there are Padres players representing in Japan.You and Clay are doing an awesome job. Congratulations on the win and good luck! Glad to see you are finding interesting experience in Japan. As a Japanese it is interesting to see how foreigners see my country. Indeed Asakusa region you visited has a lot of tradition, where shopkeeper might be 18th or 20th generaton. As on baseball side I have lived in Padre country in my youth and good to see Padres representation in Japan trip. Thanks and enjoy your stay, good luck next season as well.